What to do in Munich and what to see in Munich. Munich is probably one of everybody’s favourite German cities (and one of mine, too!). With all the stereotypical Bavarian traditions and plenty of good beer (heard of Oktoberfest?! ), it is easily one of Germany’s most-visited cities and it’s easy to spend a few days or a week there enjoying different Munich attractions. This collation of Europe a la Carte’s best tips for things to do in Munich will help both persuade you to add Munich to your must-visit list and give you ideas for planning your trip once you’re there. Munich is certainly well known amongst beer lovers and is synonymous with the excitement of Oktoberfest. Fortunately, if your visit doesn’t coincide with late September and early October for Oktoberfest, you can visit the Hofbrauhaus all year round. It’s an enormous pub in the centre of Munich with plenty of character and, of course, plenty of beer! If you are able to time your visit for the Oktoberfest fun, be prepared for Munich to be pretty crowded but for your trip to be memorable (well, depending upon how much beer you consume!). Located on the Theresienwiese, all the major beer companies set up their tents and it’s advisable to get a seat in a tent as early in the day as possible – in many tents you’ll only get served beer if you’ve got a seat. Then sit back and enjoy the traditional costumes, music and good German beer. It’s probably advisable to book a taxi in Munich for your journey back to you hotel. Munich is particularly rich in interesting museums and their themes are truly many and varied. Perhaps one for the men (or, at least one I’m not particularly intrigued by!) is the BMW Car Museum. However, the museum does sound particularly well put together with interesting and interactive displays on the development of BMWs over the years and just the building it’s housed in is worth a look in itself. For something totally different, you can try the Munich Toy Museum, located in one of the towers of the Rathaus (Town Hall). There are toys of all kinds from Europe and America from the past two centuries and even an impressive Barbie doll collection. One of my favourite museums in Munich (or perhaps the world) is the Deutsches Museum. It’s an enormous science and technology museum with excellent interactive displays and exhibitions on a huge range of topics from art to computers to toys – you should certainly allow yourself a good few hours to have a look around. It’s not just beer and museums that will keep you busy in Munich. The Tierpark Hellabrunn is the main Munich zoo and it has plenty of natural habitats for its large variety of animals. I’m a bit fussy about zoos but really enjoyed this one! You can get right on top of Munich, literally, by climbing the St Peter’s Church Tower near Marienplatz, the heart of Munich. The view really is impressive and it makes the climb up the claustrophobically narrow staircase well worth the effort. Sports fans and lovers of green open space alike will be keen to visit the Munich Olympia Park, constructed for the 1972 Olympic Games. You can go up in the Olympic Tower for more great views over Munich, enter the Olympic Stadium, and look around the park areas too. And finally, if you are in Munich in late November or December, you won’t be able to miss the Christmas markets, spread from Marienplatz through to other smaller squares in the town centre. 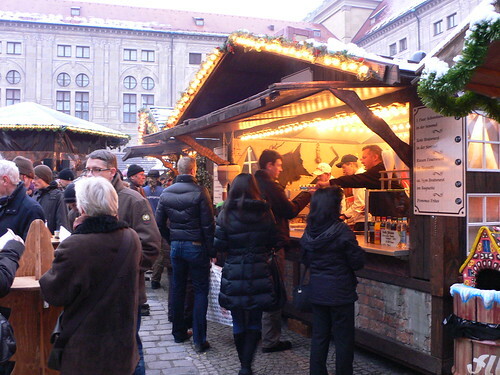 As you’d expect from a German Christmas market, there is Gluhwein and other drinks to warm you up, plenty of traditional gift ideas and some snacks for sustenance as you browse. Inka recommends a day trip to Prien am Chiemsee where you ride on the old steam tramway and visit the Heimatmuseum Folklore Museum, before taking a ferry over to HerrinInsel to visit Schloss Herrenchiemsee, the most lavish castle built for of King Ludwig the 1st of Bavaria. A heavier going but interesting Munich day trip option is Berchtesgaden, where you’ll find the Institute of Contemporary History Muncih-Berlin, home to a permanent exhibition documenting all many aspects of the Nazi period in Germany. We’ve lots of travel tips for what to do in Germany. This entry was posted in City Guides, Germany and tagged Munich on April 7, 2011 by Amanda Kendle. A visit to Munichâ€™s toy museum is a pleasure for children from 8 to 80. Get into the spirit of things by going to the Marienplatz shortly before 11am. Line up in front of the Neue Rathaus and wait for the world famous carillon (Glockenspiel) to begin. The Rathaus was built between 1867 and 1909 in a Flanders Gothic style and is dominated by the tower with its spires. Crane your neck and discover the upper part of the carillon which displays a joust arranged in honor of the marriage of Wilhelm V and Renate von Lothringen. The fun part is the lower part. At the stroke of the clock, historical figures come out and perform the SchÃ¤fflertanz. Round and round they go until they return to their â€˜houseâ€™ to await their next performance. Then turn to your right and make you way to another RathausturmÂ and enter the world of toys. The museum is located in four levels of the narrow tower, which means you climb up a spiral staircase and look at the exhibits in small rooms just off the stairs. Itâ€™s a very cosy museum with wooden floors and showcases which allow a close inspection of the collection. Ivan Steiger, a cartoonist, writer, filmmaker and journalist, born in Prague, Â has collected toys mainly from Europe and the USA going back two centuries and made his collection accessible to the public in this beautiful museum. Itâ€™s as much a joy to observe the kids as it is to look at the doll houses, dolls, teddies, toy trains and of course, a superb Barbie collection. The museum is open from 10.00 to 17.30. If you feel hungry afterwards, make your way back to the Marienplatz and to one of the many cafes and restaurants around the square to enjoy a Bavarian feast. Bear in mind that Weisswurst is best eaten before noon, but everything else is delicious all day. Read our collation post, the Best of Munich Tips, to help you get the most from your visit to the city. This entry was posted in Germany, Museums & Galleries in Europe and tagged Munich on December 30, 2010 by Inka Piegsa-quischotte. The Munich museum the Residenz was the Stadtschloss of the kings of Bavaria. One of the best ways to get there is by bicycle, set off on a sunny afternoon for a ride through the Hofgarten to reach the Residenz. Chain your mount to the many clearly indicated railings and enjoy a walk through the elaborate design, including a labyrinth, of the park and garden. A few steps away is the Residenz. My favorite is the treasury. When visiting you have to check in bags, backpacks and anything bigger than a small purse. (You can keep your kids though). Duke Albrecht V made a provision in his will that all valuable pieces which the rulerâ€™s passion for collecting had assembled, should forthwith be given a special place and could never, ever be sold. That was the beginning of what today can be admired in the treasury. His successors continued to add and the treasury was first opened to the public in 1897. I love the intimate atmosphere of the ten rooms where the secular and Â the ecclesiastical pieces are lovingly exhibited. Itâ€™s more like visiting the family treasures that a very rich uncle keeps in his mansion as opposed to visiting a museum of the magnitude of say – Â Istanbulâ€™s Topkapi Palace. Crowns, necklaces, artifacts and religious objects as well as a few bejeweled weapons are each displayed in their separate glass cases and bathed in dim light which brings out the sparkle. The museum shop offers a great selection of books about the history of Bavaria, the kings and queens and the provenance of the treasures. As the Residenz is conveniently located in the center of Munch, the museum trip can easily be ended by a walk or cycle to nearby Odeonsplatz or a coffee in the Hofgarten cafeteria. This entry was posted in Germany, Museums & Galleries in Europe and tagged Munich on October 7, 2010 by Inka Piegsa-quischotte. Oktoberfest is one of the biggest celebrations in Germany. While the name can be a bit deceiving, Oktoberfest actually happens in late September. And if you have ever been to Germany during this festival, it is a beer lover’s dream! The Hofbrauhaus brewery has one of the largest tents at the Oktoberfest, where only its own beer is served. In Munich, the brewery has a long standing history, owned by the government, it is popular with locals and tourists alike. Hofbrauhaus am Platz a great place to enjoy some of Germany’s best beers while taking in the local atmosphere. While many other pubs and bars in Germany are more traditional, there is something about the Hofbrauhaus that makes this place worth visiting. For one, it’s incredibly big. With huge tables, entertainment, and a restaurant, the Hofbrauhaus is big enough for locals and tourists alike. There are even tables reserved for regular guests at various hours throughout the week and month. Visiting the Hofbrauhaus is an experience in itself as it goes back many years in German history. The first idea for a Hofbrauhaus goes back to the late 16th century under the Duke of Bavaria, Wilhelm V. In 1592, a master brewer was hired and the first “brown” Hofbrauhaus started at the Alter hof. A brown ale was the only thing served back then. Since that time, beers evolved and the Hofbrauhaus has been part of the beer evolution for over 400 years. The Hofbrauhaus has had a long history in Munich and it’s not without controversy. In 1920, Hitler declared the 25 theses of the National Socialist program (which later became the Nazi party) here at the Hofbrauhaus. History even records some of the first attacks on Jews here at the Hofbrauhaus. Fortunately, the Hofbrauhaus has many more pleasant memories in its history. It’s 400 year history marks the evolution of beer in Germany and it is the center of many great moments in German history. Whether history was being made or being discussed, the Hofbrauhaus is a long standing tradition of German beer and a part of the culture. While many people enjoy the atmosphere, beers, and celebration that is Oktoberfest, the Hofbrauhaus is a German institution that deserves a visit. Enjoy a beer, meet some locals, and enjoy a piece of tradition in Germany. The Hofbrauhaus has recently opened breweries in other cities like Bremen, Hamburg, and similar sites all over the world. This entry was posted in Germany and tagged Munich on September 27, 2010 by Jeremy Branham. Being a great fan of King Ludwig II of Bavaria and having read many books about his life, I couldnâ€™t resist the chance to see his last castle, Herrenchiemsee on a Munich day trip. The castle is located on Herreninsel island in the Chiemsee and can be reached by ferry boat from a small town, Prien am Chiemsee, on the lake shore. You can of course drive taking the MÃ¼nchen-Salzburg Autobahn or a more scenic route, but I opted for the comfortable train. Trains run every hour from Munich and the return trip to Prien costs EURO 22. Much to my surprise, Prien am Chiemsee turned out to be a worthwhile day trip destination in its own right. When I left the station, the first thing I saw was the worldâ€™s oldest still operating steam tramway, the Chiemsee Bahn. Three to four open carriages pulled by a hooting engine, billowing clouds of steam into the air, invite the visitor to mount and take the short trip from the station to Prien/Stock where the ferry boats depart. I decided to leave the train for my return trip and to explore the town of Prien first. Itâ€™s a picture book small Bavarian town with a church and market place and my best find was the Heimatmuseum or folklore museum. Admission is a modest EURO 2 and you find yourself in a typical old stone house built in the style of the region with painted adornments around the door and windows, wooden floors, small rooms and low ceilings. The building dates from 1837 and is called Beim Mayerpaul. The exhibits of the museum reflect history and traditions of the south of Bavaria. Fishing is an age old trade around the Chiemsee and the Chiemsee Renken, which in taste and texture are similar to trout are a delicacy as is the eel. Pottery is a craft which still is very much alive on the Fraueninsel, another island in the Chiemsee and the tiles to cover stoves and ovens made by Klampfleutner of the Fraueninsel were and are much in demand. Several rooms are furnished in the style of the 19th century and you can see bedchambers, kitchens, a Biedermaier dining room and of course Trachten, the traditional clothing of the region. Well known is the Priener Hut, a hat which you can even try on. The Heimatmuseum is located opposite the church on the market place where I found a cozy cafÃ© and enjoyed a Haferl, a mug of wonderful filter coffee before embarking on my lake journey to the Herreninsel. You can find the best prices for hotels in Prien am Chiemsee using the HotelsCombined price comparison site. This entry was posted in Germany and tagged Munich on September 16, 2010 by Inka Piegsa-quischotte. Spread across an area of 10.000 m2, with a total exhibition space of around 5.000 m2, the BMW car museum in Munich attracts thousands of visitors each year. While being a car enthusiast certainly helps when visiting the museum, it is not a necessity as we discovered. The “bowl” shaped museum is just across the street from the BMW car showroom (BMW welt) and is walking distance from the Olympic Park. This Munich museum has dedicated sections showcasing motorbikes, racing cars and touring cars including the latest car models. With a lot of interactive displays, learning about the design process and history of the organisation is fun. The concept section of the museum particularly succeeds in engaging with the visitors where in several models depicting the idea and innovation phase of the BMW car manufacturing are displayed. The museum is open on Tue-Sun from 10:00 to 18:00, the entry is priced at â‚¬12. Reduced entry tickets are available for family, students and groups. This entry was posted in Germany, Museums & Galleries in Europe and tagged Munich on August 17, 2010 by arwa. Home to the world renowned brand of BMW cars, there are lots of Munich attractions to satiate the “travel” buds of tourists. Amongst all of them, the Olympia Park stands out because of its sheer grandeur and is therefore my travel tip for Munich. Constructed for the 1972 Olympic Games, the Olympia Park consists of the Olympic Tower, Olympic Stadium, Olympic Sports Facilities and the Olympic Park. The park is situated very close to the BMW Museum, at a walkable distance from the Olympic centrum bahn station. There is also a P+R at the same spot. The Olympia park has now become a venue for all kinds of cultural, social and regional events – the details of which are available on the official site. Entry in the park is free of cost, but in order to climb the Olympic Tower and the Olympic Stadium you need a ticket. The tower is priced at an affordable â‚¬4.50 – the views from the top are incredible. The stadium has an entry price of â‚¬2. Once you reach the top of the Olympic Tower, the city of Munich lies before your eyes, with the minutest details. The “green Olympics” concept has been incorporated very well into the design of the park and you can appreciate this more from the top. This entry was posted in Germany and tagged Munich on July 13, 2010 by arwa. On my recent visit to Munich before Christmas, I enjoyed a bracing walk that took my breath away – literally. This was a walk of the vertical rather than horizontal kind, up the many steps of St Peter’s Church tower just by Marienplatz, in the heart of old Munich. You pay a couple of Euros for the privilege at the booth at the bottom and then keep climbing, hoping that you won’t meet too many others coming in the opposite direction, when the stairs get narrow. Not one for those who hate heights or even those who feel claustrophobic at the thought of narrow stairwells, but once you get to the top, the view is well worth the exertion. From the top of St Peter’s you get a 360 degree view over the rooftops of Munich and down into Marienplatz, where the Christmas market was being held. If you timed you visit for 11 o’clock or noon, you’d get a birds eye view of the famous Glockenspiel on the facade of the Neues Rathaus or New Town Hall, when the painted figures turn round in time to the clock chimes. The climb reminded how many church towers there are to be climbed in the cities of Europe – I’ve climbed towers in Croatia that were downright dodgy, up the Cathedral tower in Valencia and the ultimate in Church tower climbs at the Dome of St Peter’s Basilica in Rome, where the crowds were just as pressing at the top as the bottom. Climbing a church tower is one of my travel tips as in all cases the view was wonderful and a great way to get a different perspective on the city. This entry was posted in Germany and tagged Munich on January 22, 2010 by Heather Cowper. I recently spent a few days in Munich to see the famous Christmas markets that I’d heard so much about. We stayed in the old town area close to Marienplatz, which was ideal for a short break and well placed to enjoy the different markets that were available. It’s an easy journey from Munich airport on the direct S-Bahn line and we arrived in Marienplatz, just as the famous Glockenspiel on the facade of the Neues Rathaus or New Town Hall was striking. This clock has colourful painted figures which move up and down, round and round to the chimes of the clock at 11am and noon. As we came up from the underground station, the sweet smell of gingerbread and toffee coated almonds hit us, putting us immediately in the Christmas spirit. Although the Christmas market in Marienplatz is the best known, we found it quite commercial and a centre for people coming into town to drink and party, so it got very crowded and noisy at night. Our favourite was the market we found in the courtyard of the Resindenz, the palace in the centre of Munich, which was accessed from Resindenzstrasse. This market was contained by the old stone walls of the palace and was somehow more charming, with the bandstand in the centre, where we heard different choirs, harpists and a group of Alpine Horns being played. On the second day of our visit, there was a fine dusting of snow on the rooftops, which added to the Christmas atmosphere. As well as the gifts, jewellery and Christmas decorations you’d expect to find at such a market, at least half the stalls were devoted to food and drink and it was a favourite activity to meet your friends and drink some gluwein, with snacks such as german sausages, potato rosti, crepes and sweet nuts and cakes. There was also a children’s section with different tableaux of moving figures, with accompanying recorded music or storytelling from the figures. 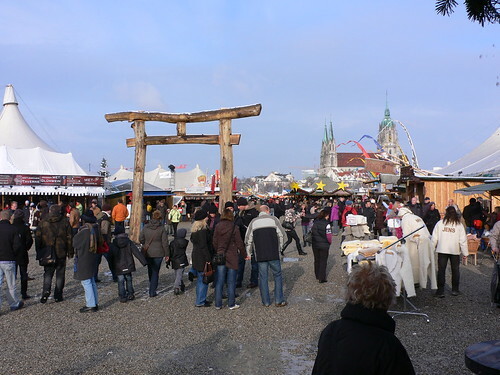 As an alternative Christmas festival, which is not so traditionally German, but more ethnic, craft oriented and organic (or Bio as it’s called in Germany) you can visit the Tollwood Market which is held on the Theresienweise Festival ground, where the more famous Oktoberfest is also held. This Market has all the usual out-door stalls with delicious Christmas street food, as well as a number of large marquees, containing craft and gift items, a circus performance tent and a food marquee where you can choose what food to eat from around the world. We really enjoyed the Christmas atmosphere in Munich, but my recommendation is to check the forecast before you arrive and pack your warm boots and thermal underwear, as the temperatures can fall below zero at this time of year. 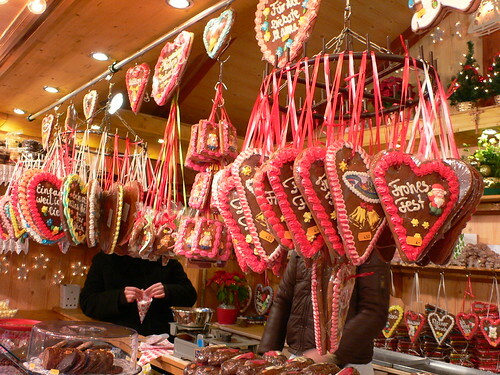 Discover another 24 Christmas Markets in Europe in our collation post. This entry was posted in Germany and tagged Munich on December 17, 2009 by Heather Cowper.